Goldfinger Law has focused lawyers to handle any accident case caused by; or involving a transport truck or transport trailer. These cases are common in Ontario given all of the busy truck traffic on our highways, in particular on Highway 401 which has one of the busiest stretches of truck congestion and activity in Canada. It’s not uncommon for large 18 wheelers to lose control on slippery highways, merge lanes without seeing a smaller car, roll over, fail to stop in time given their size and weight, or simply jackknife out of control. Truck accident cases result in serious collisions given the large size of the truck and transport trailer and often cause catastrophic personal injuries. Truck accidents may cause traumatic brain injury, spinal cord injury, broken bones, lost limbs, quadriplegia, paraplegia or chronic pain which will be need to be handled by a personal injury lawyer. Our lawyers are trained to deal with truck and car accident cases on Ontario’s busy highways. We know exactly how to deal with the difficult insurance related issues and coverage issues which these cases present. The complex interplay between the owner/operator insurance coverage of the transport truck along with the trailer; the potential WSIB issues and the accident benefit issues which these cases will present will require an experienced, knowledgeable and understanding lawyer to handle your case. Many truck drivers have called our law office only after it was too late to advance their claim because they have already filed the paperwork to advance a worker’s compensation case. As a result, they were not able to recover more lucrative accident benefits from their car insurer, and they were barred from suing the at-fault party because they elected to advance their claim through the Worker’s Compensation system. 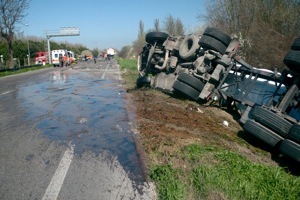 The lawyers of Goldfinger Law will help you when it comes to these complicated legal issues involving truck accidents. Don’t get hurt twice. Call Goldfinger Law and get the advice you need to give you peace of mind. Trust the name which thousands of accident victims across Ontario have trusted for years when dealing with a truck, trailer and car accident cases. All of our consultations are free, and they’re all with a personal injury lawyer trained to speak with you and give you the help you need.